Just 4 years old, TXF has a strong foothold in the trade & export finance, supply chain and commodity finance sectors. With a recent push into Project finance and Cash & Treasury Management, TXF is now a one stop shop for up-to-date news, data and innovative events in all these markets. 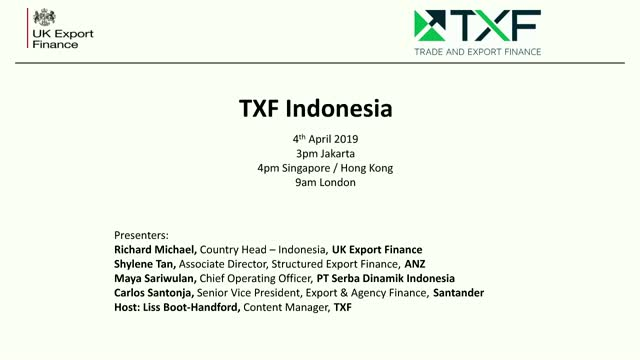 Following on from 2 successful TXF-led roundtables in Jakarta (2017 and 2018), TXF and UKEF are running a web-based meeting for the export and project finance industry based in Indonesia, The webinar will be a platform for exporters to hear the latest updates on local currency, Islamic and alternative financing available to them. What’s moved the dial in trade and treasury tech in 2018? Catch up with our webinar where we heard from a select group of international trade and treasury experts as we discussed the latest in bank and fintech efforts on trade and technology. We explored where we are in digitisation and how much the dial has moved in 2018. We looked at developments in trade asset distribution digitally, at digital trade credit insurance, at cross-border payments developments, and, of course at blockchain. Alfonso Olivas, Head of Data & Analytics and Katharine Morton, Head of Trade, Treasuy and Risk discuss the sectors and markets driving this upturn and how they expect the market to perform over the rest of the year.